Fact: The bonus you get depends on which Black Chip promo code you use. Fact: You're guaranteed to get every Black Chip Poker deposit offer in 2019 with this bonus code. This is the biggest part of the Black Chip Poker bonus: your extra cash. Turn it into real money as you play cash games and tournaments. 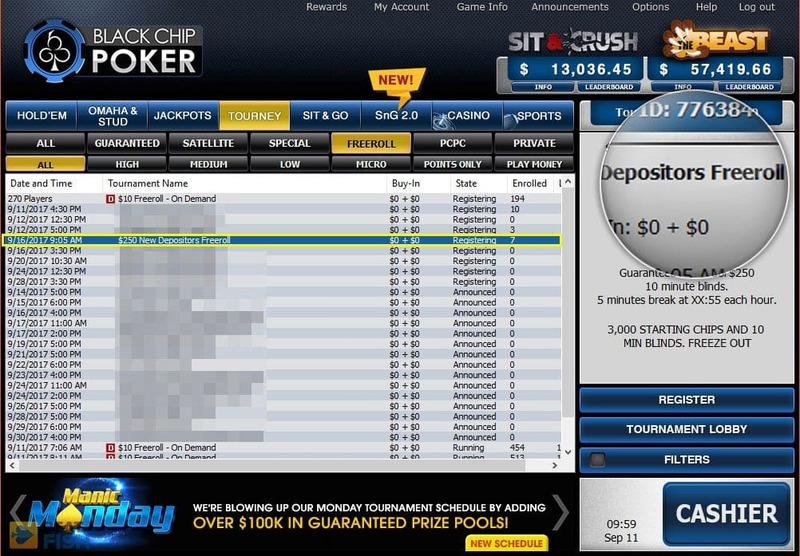 This is essentially Blackchip's rakeback system, with prizes up to $2,500 monthly for the top finishers. Even if you deposit the minimum, you'll get 4 Black Chip Poker tournament tickets for $250 private freerolls. Besides instant cash bonuses, Black Chip Poker will allow you to exchange your points for tournament tickets and free merchandise. It's kind of a weird system, but Black Chip Poker is sticking by it. As you're making a new account, there's a box for a Black Chip Poker bonus code. Enter the magical letters, deposit, and unlock everything, both publicly and privately, that Black Chip Poker offers. The epic fail comes when bright-eyed prospective Black Chip Poker players either skip a bonus code entirely or, even more painful, they get their promo info from poker sites who seemingly put it out using Frontpage and a 56k modem. I went straight to the source - the poker site folks themselves - to guarantee I was offering players the maximum Black Chip Poker bonus code. Simply put, this is the most you're going to get. After claiming your bonus code and depositing, you also need to know how the 2019 Black Chip Poker deposit bonus works so you claim everything. Blackchip has a pretty generous bonus, but if you don't click the right rewards buttons and enter the right tournaments, you'll miss out. Let's dive into everything you'll get using this Black Chip Poker bonus code and how exactly to profit most from it. For 2019, new Black Chip Poker players have a chance to claim a big welcome bonus up to $1,000 using the right bonus code. Whatever amount you deposit between $25 and $1,000, the room will match 100%, effectively doubling your bankroll. Of course, like all poker bonuses, players don’t get money beforehand, but it is released as you play and generate rake. Once you create your Black Chip Poker account using the BCPBTF bonus code and make a deposit, the welcome bonus is added to your bonus balance. For example, if you deposit $25, another $25 will be added as bonus cash. This money will be released by Black Chip Poker as you play on cash game tables and participate in tournaments. The Blackchip bonus is released in $1 increments, regardless of the total amount. You’ll have $1 transferred from the bonus funds to your real money account every time you generate 27.5 Award Points. 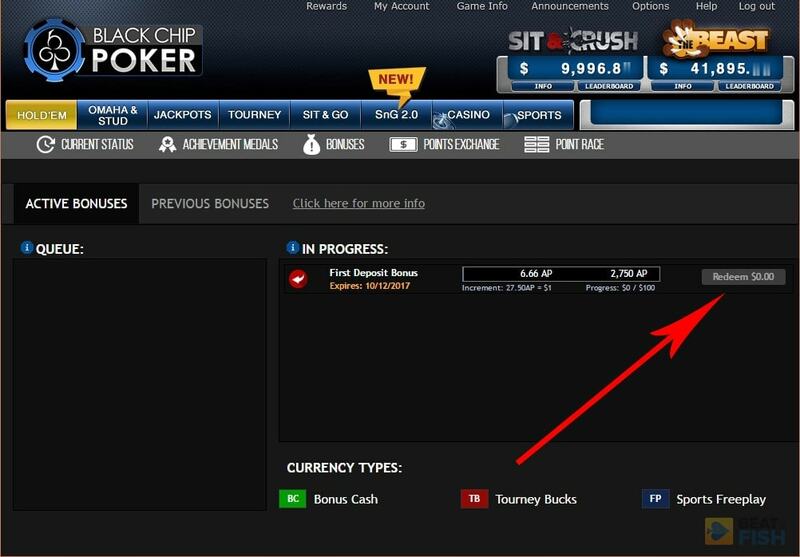 It's a bit obnoxious, but Black Chip Poker makes players wade into the Rewards tab and click "Redeem" to transfer bonus money to the cash balance. Don't forget to do that. Black Chip Poker gives you 60 days in total to clear the bonus. After the 60 days period, any remaining bonus funds will be removed from your pending balance, but you’ll keep everything you’d managed to release up to that point. In addition to the bonus money, all Black Chip Poker first depositors also get four entries to $250 depositors’ freerolls by using a bonus code. These may not seem as a huge value to someone claiming the full amount of the bonus, but for someone looking to kick-start their poker bankroll, this can be a very nice boost. Also, in 2019 you’ll get four tickets even if you only deposit the required minimum of $25, so for those with limited funds, this can be a very nice addition. The Beast is a points race at Black Chip Poker, which, in fact, acts as the room’s rakeback program. The Beast is heavily geared towards serious grinders, but there is money to be made here, if you set your mind to it. This rake race is completely free to participate in and all BCP players are automatically entered. There is no extra rake taken from the pot to feed the leaderboard, so this is straight up extra cash you can use to pad your pockets. The only important thing about The Beast is the number of Player Points earned. The more you play and the higher the stakes, the better off you’ll be. At the end of every month, the top 90 players on the points’ leaderboard are awarded. The top few finishers receive $2,500 each, then there are a few $1,000 prizes, continuing all the way down to the bottom of the leaderboard, where rewards are around $100. For cash games, it is good to remember that BCP uses the Weighted Contributed Rake system for promos and rakeback, which means the amount of rake is calculated based on your total contribution to the pot (not shared equally among all the players in the hand). As for tournaments, Action Points are added within 24 hours. In addition to The Beast, which rewards only the highest-raking players, there is also the Elite Benefits program, which gives something back to everyone. From the first hand played on Black Chip Poker, players become a part of Elite Benefits. The idea is simple, the more you play, the more points you generate, as you progress through six different ranks – from Player and Rounder, across Grinder and Veteran, all the way up to Legend and Icon. Every $1 paid in rake or tournament fees generates Benefit Points. These help you move through the tiers, and as you move up, you’ll start earning more Player Points for the same amount of rake paid. These points can then be exchanged for all sorts of merchandise and tournament tickets. Black Chip Poker, a part of the Winning Poker Network, is one of the few quality online poker rooms in 2019 open to players from the USA. Blackchip Poker represents one of the better choices for Americans, but it is also a nice choice for players from the rest of the world, primarily because of their welcome bonus code package. One thing that all rooms on Winning Poker have going for them is the fact they're really not stingy when it comes to welcoming new players, and they give a lot of value on the first deposit. For Black Chip Poker, this is equally appealing to serious and recreational players alike, as we all appreciate a nice boost to our poker bankrolls. Does Black Chip Poker have a no deposit bonus code? No. In 2019, new Black Chip Poker players must use a bonus code and make a deposit in order to receive a bonus. There are currently no no-deposit bonuses for any US-friendly online poker site. Minimum deposits are eligible for the complete bonus at Black Chip Poker, which start at $25. Does Black Chip Poker offer a reload bonus? Sometimes. 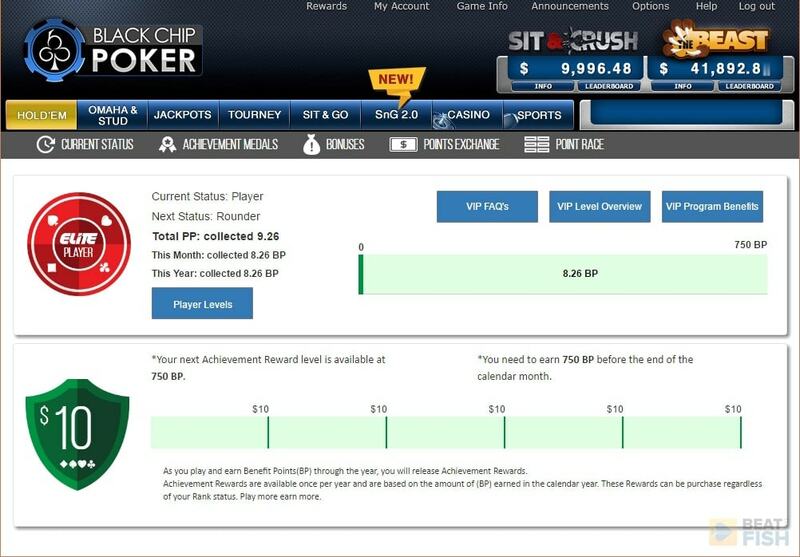 Black Chip Poker occasionally offers promo incentives to existing players to get them to make another deposit, or "reload". You will most likely only hear about reload bonuses and codes from a splash screen when opening the Blackchip software or from a direct email from the poker room. Using the Black Chip Poker bonus code on this page when you make your account will allow you to enter possible future private events, such as real-money freerolls. As shown in my enormous Black Chip Poker review, this is a perfectly capable online poker site, especially for USA players. as BCP also offers a number of convenient deposit and withdrawal methods and reasonable cashout speeds. For everybody else, this deposit bonus is nothing to sneeze at, especially at the time when almost every poker site is decreasing their rewards. Bonus code BCPBTF guarantees a complete bonus.